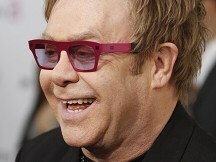 Sir Elton John is returning to Las Vegas for a three-year headlining gig at Caesars Palace. The five-time Grammy winner played on Wednesday night for the first of 16 shows scheduled in October, the first performances of a new show, The Million Dollar Piano. The remainder of the shows during the three-year run have not yet been announced. Sir Elton said it was named after the instrument he will play during the show - a piano that took manufacturer Yamaha four years to build. "It's going to surprise a lot of people," he said of the instrument earlier this year as the show was announced. "This isn't like the old days. It's going to be certainly different from anything you've seen from me before, as was The Red Piano (his previous show at Caesars)." His return comes more than two years after that five-year stint that ended in 2009. The run was originally planned for three years but was extended because of demand. The Red Piano included risque imagery - with high-tech videos and large, inflatable props - plus the hits Sir Elton has become known for during a career spanning more than 40 years. Sir Elton is one of music's most decorated stars, known for songs including Candle In The Wind, Rocket Man and Bennie And The Jets. He won an Academy Award in 1994 for his original song, Can You Feel the Love Tonight, from Disney's The Lion King. He was knighted in 1998, inducted into the Rock and Roll Hall of Fame in 1999 and honoured by the Kennedy Centre in 2004 for his lifetime contributions to performing arts.